Our new Nikkor 55-200mm digital zoom lens and tripod let me take this picture of the moon setting in the distance across the street. Click on the picture and you can even see the moon's craters! 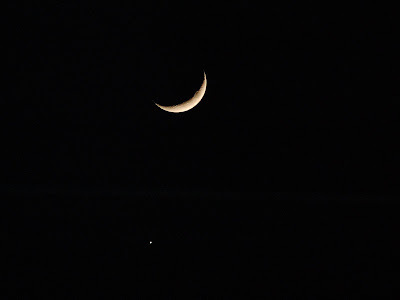 That's Venus below it - according to what I've read, this conjunction of Venus and the moon are most visible when the moon is waxing toward its new phase. I saw this as I was leaving Long's on Ashwood, and I tried to take a photo with my cheap camera, and of course, it didn't come out. Your photo is AMAZING!! I can't believe you can even see the moon's craters. That must be one awesome camera!